In computer science, a data structur is a pairteecular way o organisin data in a computer sae that it can be uised efficiently. ↑ Black (ed. ), Paul E. (2004-12-15). Entry for data structure in Dictionary of Algorithms and Data Structures. Online version. U.S. National Institute of Standards and Technology, 15 December 2004. Retrieved on 2009-05-21 from http://xlinux.nist.gov/dads/HTML/datastructur.html. ↑ Encyclopædia Britannica (2009). 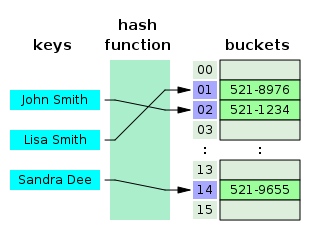 Entry data structure in the Encyclopædia Britannica (2009). Retrieved on 2009-05-21 from http://www.britannica.com/EBchecked/topic/152190/data-structure. This page wis last eeditit on 24 Mairch 2017, at 17:38.